FIRST KISS: Ziggy, who grieved for two months after the loss of his faithful, lifelong wife, Toto, finally has a new bride. 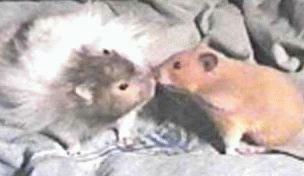 In the picture Ziggy (long-haired black & white) gives Buffie (golden brown) a little kiss. Buffie is the granddaughter of Sherman and Juliette. Her aunt, Gabby (daughter of Sherman and Juliette), is married to Tripod's brother, Nico. THE HONEYMOON: Married in a lovely ceremony on Tuesday, November 4, 1997, Ziggy and his new bride Buffie begin a glorious honeymoon. They are anxious to start a family immediately. 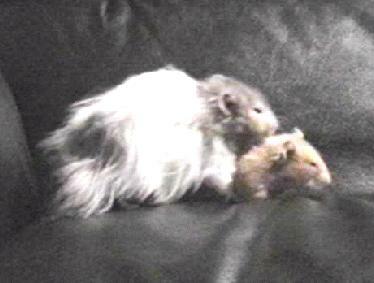 Eight babies were born to Buffie and Ziggie on 25 November, 1997. So far, it seems all of them will be black and white like their father.